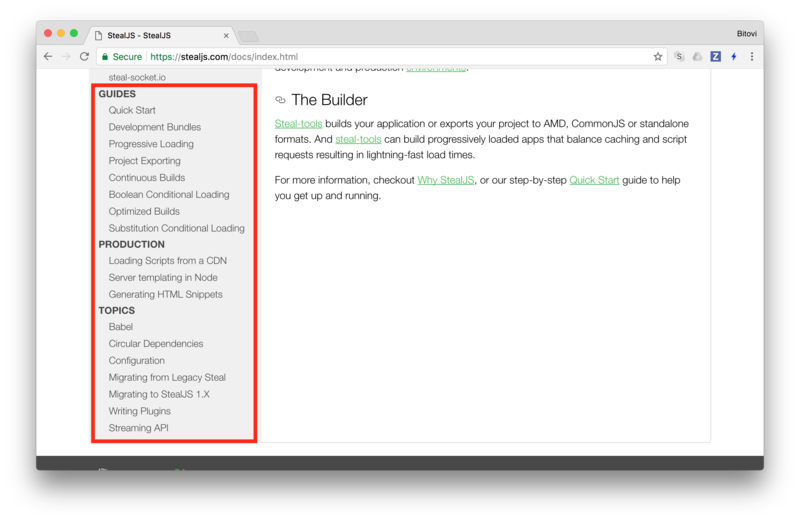 tldr; Our API docs should be grouped by the common topics that people need help with. This proposal seeks to update the API page to make the important topics stand out. Guides and Topics are really kind of the same thing. In this case guides are step-by-step instructions, but there is little overlap, so it doesn't make sense to separate them. Common things people care about are missing, like live-reload. I would like to group our docs by the topic they are associated with. This will make it easier for users to find exactly what they are looking for. Learn from a high level what the topic is about and how Steal helps. Link to API documentation (steal and steal-tools, even ecosystem packages). Link to any step-by-step guides. - Finalize the list of topics. - Move existing topics out of steal/steal-tools and into stealjs repo. - Create new groupings for Development, Bundling, Advanced. - Write new docs that we don't currently have.